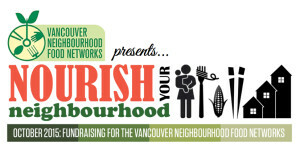 Throughout October participating businesses across the city are partnering with the Vancouver Neighbourhood Food Networks to raise funds for our work. Participating businesses will be donating proceeds from their special promotions to your local neighbourhood food network and to the citywide Vancouver Neighbourhood Food Networks. The Fish Counter: Partial proceeds on October 17 Pink Salmon Day will be donated with thanks to the FISH counter and the MV Pacific Provider. Nester’s Market Main Street: A Healthy Gift Basket will be raffled off at Garden Fantasies: A Seed to Seed Event, hosted by the Little Mountain-Riley Park Neighbourhood Food Network, in partnership with the Terry Salmon VPL Branch and the Riley Park Hillcrest Community Association, on October 18th from 1-4pm at Hillcrest Community Centre.